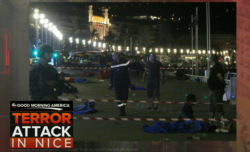 The CBS News article focused on the University of California-Berkeley chancellor’s statement once the news of Nicolas Leslie’s death was confirmed among the dead in Nice, France. But, there was no mention of the role of radicalization or radical Islam in the truck attack on tourists and civilians alike on Bastille Day. From CBS News: For many, there was nowhere safe to go. The vehicle zig-zagged for just over one mile until police shot and killed the driver. Authorities found a handgun, assault rifle and fake hand grenades in the truck. An investigation is ongoing to determine whether this was a lone wolf attack.